On Tuesday, June 5th, in order to fulfill an urge for a very tasty, beefy meal, I decided to make Mongolian Beef for dinner. 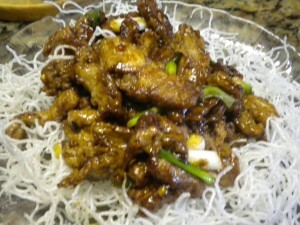 Mongolian Beef is usually made with Flank Steak which at times can be a little on the chewy side. In order to fully enjoy the meal and not have to cook the meat for more than a minute or two, I decided to make it with Beef Tenderloin. It may be somewhat more expensive but when you are only cooking for two, it hardly matters as compared to the enjoyment of the meal. Mongolian Beef is usually found on the menu in Chinese Restaurants and as the name implies, its roots stem back to the Mongols. The Mongolians invaded and put forth their influence in many of the Asian countries. Traditional Mongolian Beef is served with Mai Fun Noodles which are a rice noodle, which when cooked in hot oil, will puff up instantly and provides a nice contrast to the beef which can be a bit spicy, if prepared with an ample amount of chilies as the recipe calls for. In our household, we do not like our food to be ultra spicy, so I always use a moderate amount of chilies, however we still like the dish with puffed rice noodles which also provide a nice texture contrast. Along with the Mongolian Beef, I served Broccolini which is very similar to Chinese Broccoli and which does not have the same amount of buds on it as western broccoli, but is instead more leafy and has longer, more tender stems, making it taste like more of a cross between broccoli, spinach and asparagus. Broccolini, in fact, is actually a cross between Western Broccoli and Chinese Broccoli. I started preparations about one hour before dinner by slicing the meat across the grain into ¼” thick pieces that were slightly less than ½” in diameter and about 1- 2 inches long. The meat was then marinated in a mixture of Egg White mixed with Cornstarch and refrigerated. 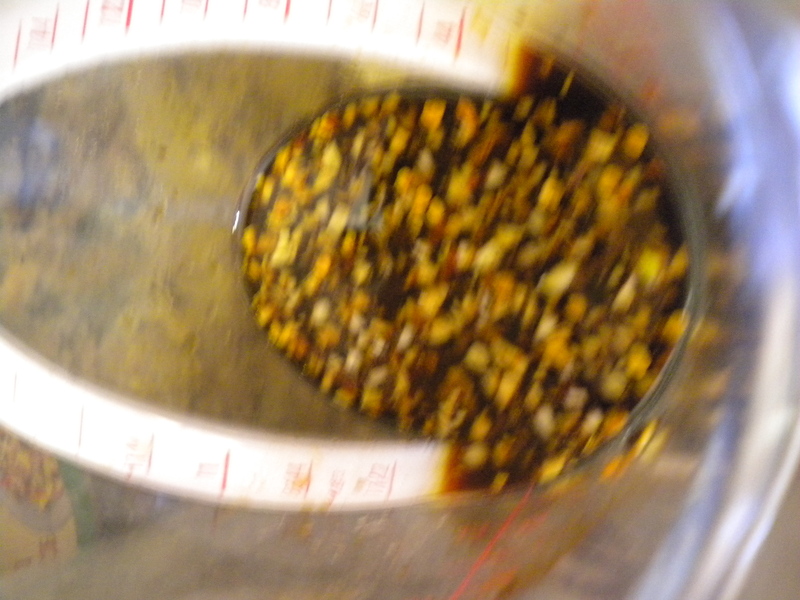 Then I mixed up the ingredients for the sauce which included Soy Sauce, Bean Sauce, Garlic and Sugar. 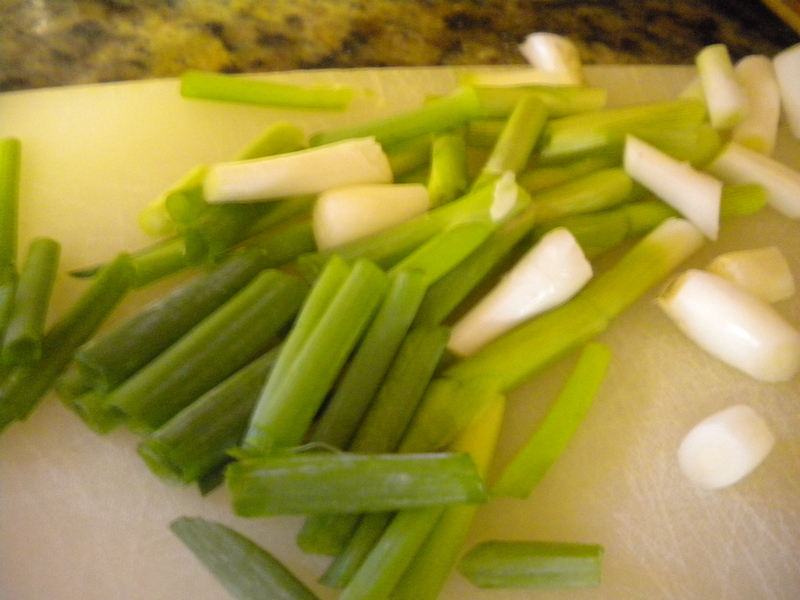 Wash, dry and cut a bunch of Green Onions up into 2″ pieces and set aside. 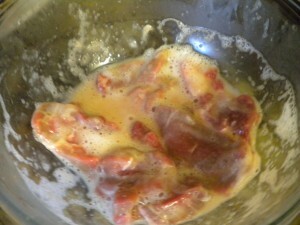 You will also need a Cornstarch/Water slurry to thicken the sauce. 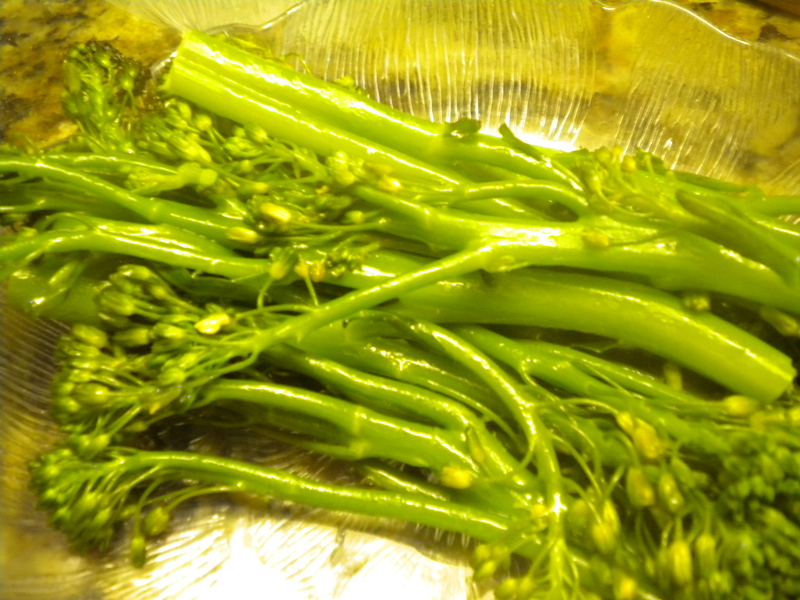 Next I washed and trimmed the Broccolini and set it aside. I love Cucumbers and made a marinated Cucumber Salad. Just thinly slice your cucumbers, lightly salt them and set aside. Once the Cucumbers release some of their moisture, you can then drain them and rinse if they are too salty. Next add some Seasoned Rice Vinegar, Garlic Powder and a little Peanut Oil. For a Thai variation, add about 1 Tbsp. Fish Sauce. If you are serving Rice, begin cooking the rice and then heat about 2 inches of Oil in a wok or sauté pan. Once the Oil is hot, add your Mai Fun Noodles (they should be broken up before cooking – the easiest way to break them up is to put them in a plastic bag that can be sealed – this avoids getting rice noodles all over the kitchen). 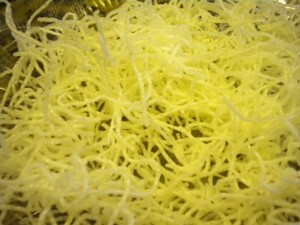 Cook a small amount of noodles at one time – if they don’t immediately puff up to the surface the oil is not hot enough. Using your thermometer to ascertain the correct temperature which should be about 360 degrees. Remove from the oil with a spider or slotted spoon and place on a cooling rack placed over a baking pan for them to drain. Lightly sauté the Broccolini in a sauté pan, shut off the heat and cover until ready to serve. 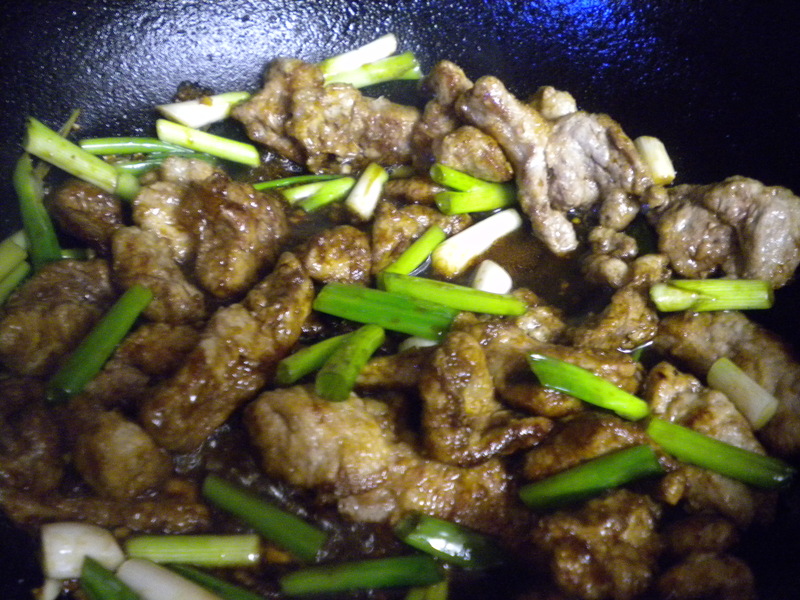 Next, remove the meat from the refrigerator and cook a few pieces at a time in the hot oil. This will take less than a minute – you just want the coating to brown. Remove the meat as it cooks. Once all the meat is cooked, remove all but about 1 tablespoon of the oil. Add the ingredients for the sauce and cook for about 2 minutes over high heat. Add the Meat, Onions and Cornstarch mixture and cook for another 2 minutes or until the sauce is thickened. Turn the heat on under the Broccolini and heat for about 1 minute or just until the Vegetables are hot. Place the cooked Mai Fun Noodles on a serving platter and top with the meat. Serve immediately with steamed Rice, the Broccolini and Cucumber Salad. The above preparation will feed four people.